Roj Khordad Mah Sherevar, 1378 Yz. We have seen in the earlier post that attending the Paidust is more of a spiritual responsibility rather than a social chore. After examining the correct attire for a Paidust let us now proceed further. 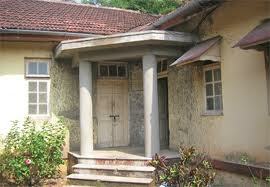 The Dungerwadi premises comprise of a number of Bunglis or small bungalow cottages where the four days’ ceremonies of Parsis are performed. After ascertaining which Bungli is hosting the prayers for the deceased person concerned, Parsi attendees to the Paidust should go up near the Bungli gate where they will observe a small tank of water and an attached basis or open pit just outside the gate. Use this water to wash the covered parts of the body – the hands, the face and neck and dry the same. Standing in such a position as to face the Sun and ensuring that no person can pass about 9 feet in front of you, start reciting the Kem Na Mazda prayer. On completing the prayer, untie the Kusti from the waist and begin the recitation of the Hormazd Khodae prayer, tying the front and back knots of the Kusti as per procedure. Then finish the recitation of the Jasa Me Avangahe Mazda prayer. While performing this Kusti two thoughts should be passed through the mind. May the performance of this Kusti clean my aura of any impurities it may have accumulated since the last Kusti. May this performance help the Ruvan (soul) of Mr. X (name of the deceased) attain the protection of Sarosh Yazad in its onward journey. It is only after performing the Kusti that one should enter the Bungli. It is important to note that once the body of the deceased is placed on the stone slabs of the Bungli and the Sachkar ceremony is performed, the Bungli acquires the temporary status of a consecrated area and hence all rules which apply to the conduct of oneself in an Agiary also apply to the Bungli. It is pertinent to bear in mind that the Ruvan of the person has now left the body and is sitting beside the head of the body, where a specially lit lamp is placed and kept burning for all the four days. The body itself is now merely a shell, which has started decomposing. This process of physical decomposition also attracts a negative spirit called Druj Nasu – the demoness of pollution. This attack of both physical and spiritual pollution is harmful to the Ruvan of the person which is sitting nearby. The beneficent chants of the Avesta being recited by the priests or by relatives helps in keeping the Ruvan safe from the Druj Nasu. Even the Kusti Manthras recited by each attendee to the Paidust help in fortifying the soul for its long onward journey. It is thus the responsibility of every Parsi who attends the Paidust to follow the steps mentioned above as his or her personal contribution to the welfare of the soul of the deceased. After paying respects to the deceased, the relatives should be met quietly and discreetly, at some distance away from where the body is placed. At no point of time should there be any loud talk in the Bungli or the ringing of mobile phones, with each ring tone worse than the other. The only sound in the Bungli should be the recitation of the prayers by either the priest or by a any relative of the deceased. It is extremely harmful for the dead body to be left unattended at ANY TIME during this period. Relatives should take short 30 minute turns to recite ANY prayers from the Khordeh Avesta books available in the Bungli. What is important is the creation of the vibrations of the Avesta Manthras which will protect the Ruvan. After meeting the relatives and any other acquaintances, one should take a seat and softly start reciting the Sarosh Baj prayer. If the prayer is not known by heart, there are a number of prayer books kept in each Bungli, in both Gujarati and English which can be used. Somewhere in the middle of the prayer, the Kem Na Mazda is to be recited. This recitation should go on till the words ‘Astavaitish Ashahe’. The next sentence ‘Nemascha ya Armatish Izacha’ should NOT be recited. This recitation of half the Sarosh Baj is technically known as “Taking the Baj”. The remaining part of this prayer will be finished much later, after the body has been consigned to the Towers of Silence. That recitation is known as “Putting/Finishing the Baj”, which we will discuss later. The important thing to remember now is that one is “in Baj”, that is, one has started the recitation of a sacred Avesta Manthra. Now until that Manthra is finished, NO OTHER WORDS (except specific Avesta) can come out of our mouth, or the Baj is said to be “Broken”. After “taking” the Baj of Sarosh, there are two options. Either one can sit in complete silence and pass thoughts through the mind for the soul of the deceased, or in a soft tone one can continuously recite the Ashem Vohu prayer. Another better option is to sit with the Khordeh Avesta book open so that a curious friend does not try to interrupt and talk with you, thereby nullifying and breaking your Baj. Soon the Nassehsalars will come in with the iron bier (called Gehan) and sit down next to the body and begin reciting some prayers. If you hear carefully you will observe that they are also “taking” the Baj of Sarosh. Immediately thereafter, the two priests who will perform the actual ‘Paidust’ or Geh Sarna ceremony come up to the door of the Bungli and after bowing down in respect to the departed soul, they will themselves start with “taking” the Baj of Sarosh and thereafter start the recitation of the Ahunavaiti Gatha, which is the main part of the Geh Sarna ritual. We will discuss the further steps in our next post. We are blessed to be enlightened by you. After completeing almost 3 decades of my life i didnt know the significance or the correct manner as you have detailed above. My humble request shall always be to have more and more of such knowlegable articles from you, so that we learn and inbibe a better way of life. Lastly, i feel in the second para, where you have mentioned washing of hand, face & neck, you mean the uncovered parts and not covered as stated above. Thanks very much Ervad Saheb for educating me apropos the Paidust rituals. You have very nicely described the procedure for ‘ taking the baj ‘ & ‘ leaving the baj ‘ in part 2 & 3, for people who go up with the ravaan. Can you pl tell us what is the sequence of prayers for people who do not go up with the ruvaan ? How do they ‘Leave the baj ‘ ? Do they also have to take a bath before resuming normal lifework ? Good question! For those who do not accomany the Paidust to the Dokhma, they should leave the Baj after paying the last respects to the body just before it is carried out of the Bungli. After leaving the Baj, they should perform the Padyab and then the Kusti in the pavilion outside. If they have not gone very close to the body and have not followed the body as it is carried away, there is no need for taking a bath. They can proceed to work directly.